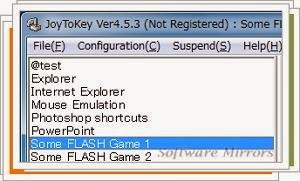 JoyToKey is a program to emulate your keyboard and mouse and convert them to Joysticks. We often use keyboard shortcuts to switch views between different screens or programs that we are using or other commands to your computer like create files, save, copy, paste, etc. Now, with JoyToKey all this can be done from your joystick, with this software you can program all keystrokes (or keyboard shortcuts) you want, whether or not already on your computer. Each button of your Joystick can be assigned a different key combination. JoyToKey can also program a joystick movement accompanied by pressure on one or more keys to create new combinations. The possibilities are endless. You can even schedule the second pressure on the button to respond in one way or another. JoyToKey can also use your joystick to scroll through the browser, the desktop or the surface on which you are working, just like you do with your mouse.